Working in office typically involves spending a great deal of time sitting on a chair – a position that adds on stress to the structures of the spine. Hence in order to avoid developing back problems, it is important to have an office chair that is ergonomic, supports the lower back and also promotes good sitting posture. There are certain factors that needs to be reviewed prior to make a choice to buy a perfectly fit office chair. These factors will allow the individual to make the chair work well for his or her specific needs. Spine-health offers more insight on various conditions, treatments and wellness pertaining to the spine and back pain problems. 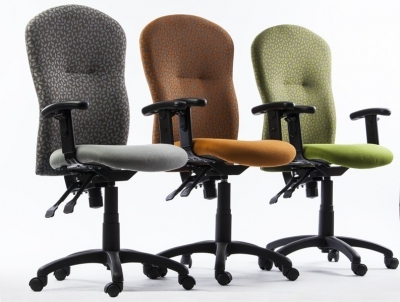 The Herman Miller write-ups on Ergonomics is a good resource to gain more knowledge on varied topics on Ergonomics. There are certain very important factors that need to be considered while making a choice of an ergonomic chair. Seat height: The seat height should be easily adjustable with a pneumatic adjustment lever. The normal seat height ranges between 16 and 21 inches off the floor and that should work for most people. This height allows the user to have his/her feet kept flat on the floor with the thighs horizontal and arms are set even with the height of the desk. Seat depth and width: Generally, a width of 17-20 inches is standard. The depth from the front of the seat to the back needs to be enough so that the user can sit comfortable with the back against the backrest of the chair leaving approximately 2 to 4 inches gap between the back of the knees and the chair seat. The forward or backward tilt of the seat should be adjustable. Lumbar support: Lower back support is very important in an ergonomic chair. The lumbar spine bears an inward curve and sitting for long time without a support for this curve may lead to slouching, which flattens the natural curve, and it strains the lower spine structures. Backrest:The backrest of an ergonomic office chair needs to be at least 12 to 19 inches wide. It should be adjustable in height and angle if the backrest is separate from the seat and should be able to support the natural curve of the spine giving special attention to proper lumbar region support. Seat material: The material on the office chair, both seat and back, should have enough padding so that it is comfortable to sit on for an extended period of time. Having a breathable cloth fabric is preferable to a harder surface. Armrests:The armrests should be adjustable allowing the user’s arms to comfortably rest on it and the shoulders to be relaxed. The elbows and lower arms should rest lightly, with the forearm not be on the armrest while typing. Swivel: A conventional or ergonomic chair should easily rotate so the user can easily reach different areas of the desk without straining. Nice post with good insight.